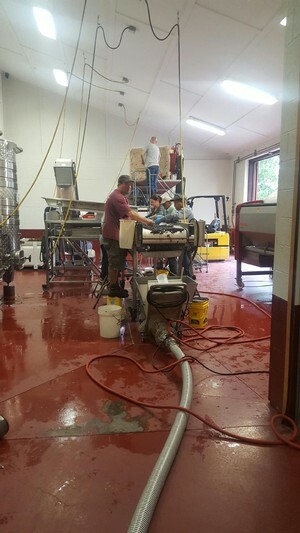 We processed Merlot this week! 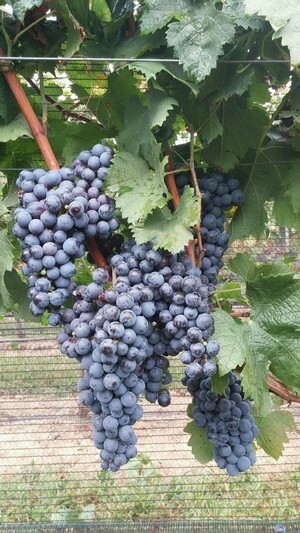 Anyway, this week at Karamoor we picked our Merlot! We don't have too much Merlot planted here anymore (we had to remove a good portion of it between last spring and this spring due to disease and winter kill), but for some reason, the Merlot that we do have planted yielded 4.5 tons to the acre...even after crop thinning, etc! Oh, that wild Merlot. Never know what you're going to get. 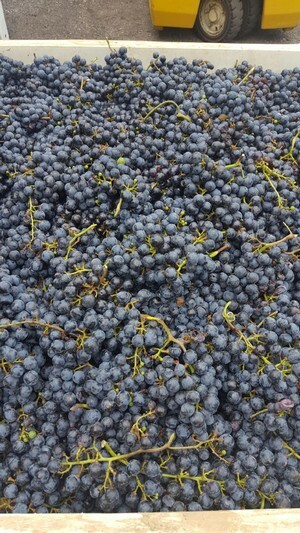 So, Kevin and his crew were out there last weekend and finished picking Monday. I've got some nice photos that I am going to share now...so it will almost be like you were helping us pick! That gorgeous Merlot joined the rest of its gorgeous Merlot brothers and sisters! Check out that color! All the crush room toys set up and working at full steam! Hopper, destemmer, sorting table, and some quality assurance people! Close up of winemaker, Kevin, picking out berries, leaves, bugs, etc. that he doesn't want in his 2016 vintage of Merlot! Hi everyone! I hope that you have been well. Sorry I did not post last week, but I was in Chicago for my little brother's wedding! It was a great weekend. On Thursday night, my mom and dad had planned a cocktail party to celebrate the happy couple. They did an awesome job (even though Dad's speech was like 45 minutes long) because they were so thoughtful in all the details. They really made the party about his roots, her roots, and then the roots that they are going to put down as a family in Chicago. My parents are just the best. And then on Friday there was a little rehearsal (and some Bloody Mary's) on the rooftop of my brother's gym, then we went to the Cub's game where they won in the 10th inning, that was followed up by a pizza party for all the Greeks and additional family that came from out of town. Saturday was the main event. Zack, Steph and her family did a great job with planning. The ceremony was personal, the food was great, the Tito's was flowing, and the band was playing all the great dancing songs. Two of my guy cousins were my brother's best men - they gave a great speech that made everyone laugh and cry. Her dad's speech made everyone tear up. My brother and his bride have never looked happier. Matt and I flew back on Sunday morning...11:45AM was still too early for a flight that day... Great weekend. On Monday, it was back to work (though I was a little tired...) and we started thinking about what to send out for wine club. What to send....what to send? We came up with quite a treat for all, I think you will agree. Our Signature Mixed Club will be receiving a bottle of our 2015 Sauvignon Blanc, a bottle of our 2013 Merlot, and a bottle of our 2013 Reserve Merlot. "But Ali, how is the Signature Mixed Club getting a discount on a reserve wine? "...is probably what you are thinking right now. Well, I will tell you why. It's because we make our own rules here at Karamoor and we thought it would be cool for you to be able to taste our 2013 Merlot and 2013 Reserve Merlot to see what the differences are. We are so nice! Our Signature Red Club will be receiving a bottle of our 2015 Sauvignon Blanc, a bottle of our 2013 Merlot, and....you guessed it: a bottle of our 2013 Reserve Merlot. I like this shipment a lot because you are getting all Merlot. In totally different forms. Our Reserve Club is going to be receiving a bottle of our 2014 Barrel Select Cabernet Sauvignon, a bottle of our 2013 Reserve Merlot, and a bottle of our 2010 Meritage from our private library stock. Here is what Kevin and Shaina wrote about the 2010 Meritage this week when they tasted it (they get to have all the fun): A long, warm growing season made the 2010 vintage one of the best in Southeastern PA to ever come around, and the Karamoor Estate Meritage was no exception…Aromas of ripe, sweet plums and black cherries are shared on the palate along with dark berry, vanilla, and currant flavors. Velvety tannins structure the wine leading to a long, soft finale… Quite the wordsmiths, aren't they! Picking allllllllll the white grapes this week! I love short weeks! Don't you? They always seem to go by in a flash because you are trying to cram everything that you do in a normal week into just 4 days. So, it's already Friday! Yippee! I have to say, I had a great weekend last weekend. Normally we are up in New Hampshire for Labor Day Weekend, but we had a wedding to attend last Sunday, so we couldn't go! I was pretty bummed about it at first, but we had an action packed weekend which turned out to be a blast. On Saturday, Matt and I played a few holes of golf and then headed to the King of Prussia Mall to take advantage of some of the Labor Day sales. We bought bedding for our guest rooms, throw pillows, throws, and all types of decorative things. Homeownership is fun. Then, we had our friends over for a fancy cheese party. By "fancy cheese party", I mean that the cheese was fancy...not the party. I was still in my golf clothes from the morning. I put out enough cheese to feed a small army, so imagine my surprise when we managed to finish almost all of it. Very impressed. After the cheese, we grilled up some meats and then we built a fire and made s'mores. Nobody left hungry that evening. On Sunday, we had the wedding (we girls pretty much had to crisco ourselves into our dresses due to the cheese from the night before...). Tito's was flowing and the dance floor was open for biz. Lots of fun with all of our friends, and the couple looked so so happy all night. All these weddings that we have been going to is giving me anxiety over the fact that I have finished what feels like next to nothing for our big day. I started registering and it said "241 days until your wedding" and I almost had a meltdown! On Monday we played 18 holes and then we took naps (because of too much fun). Speaking of naps, I bet Kevin and his crew could use one. They have been picking and processing grapes all week! 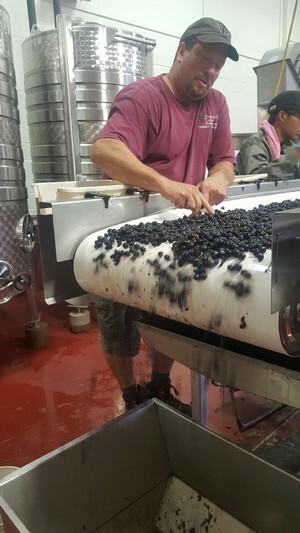 They will finish picking all the white grapes this weekend and then they will more than likely start picking Merlot towards the end of next week. If you follow us on Facebook, you have probably seen some photos and a video. That has been life for them everyday this week! What was not pictured in the photos was a tractor breakdown, swarms of bugs and mosquitos, and this heat... Ahhhh life in the vineyard! Don't they look delicious? They totally are! Hard at work. They are the best! Sweetest grape juice you have ever tasted. SO GOOD. While I've got you here, I wanted to let you know about a few upcoming events! First one, tomorrow. I will be at the Doylestown PLCB store tasting all of our wines. Well, I won't be tasting them...but you could be. I will be pouring them! It will be from 2-4PM at the Veterans Lane location. In addition, we released 2 new tour dates; one is Thursday, September 22nd at 3PM, the other is Monday, October 10th at 3PM. The Monday date is Columbus day. Hopefully you work for the banking industry and have off so that you can join us! We also have a few tasting dates in the works for some additional PLCB stores the first week of October. I will add them to the calendar when they are firm!